Based on experience, this guide will show the steps and considerations involved in moving a HTTP site to HTTPS when it uses an apache web server. It may not be comprehensive or perhaps only partially relevant but there should be food for thought on some of the considerations to be made. Does your web host and/or domain provider support HTTPS and also allow provision of a SSL Certificate? You need to make sure this is possible and you can budget for it in the case of any additional costs. Enabling the HTTPS version of your site can then be done and should be possible to do while the HTTP version is still running. Hopefully you will have lots of external links back to the HTTP version of the site that will continue to be used for a long time. There is no way to avoid this, therefore you must setup a permanent redirect for all traffic to the website, folder and page to the HTTPS equivalent. Obviously, change the 2 instances of website.com to suit your needs. It is important that all external resources (scripts, images and libraries from locations not on your domain) use HTTPS as well. If your site uses HTTPS but one or more resources are loaded via HTTP, the browser is likely to flag this as a security warning. Getting your site in a state that stops these warnings could take a lot of effort, depending how controlled things are. The more effort that can be put in to this prior to the HTTPS switch, the more seamless things will be. A quick rule of thumb is to search for “http” in your content and for any resource found, see if it can be called via its https counterpart manually. 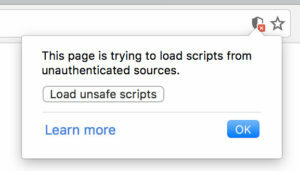 Google Analytics will continue to work fine however if you use Google Search Console you will need to add the new HTTPS version of the site as if it is a new website. You can keep or disregard the previous HTTP listing. My advice would be to keep it for a while so you can at least see the traffic volumes decrease. The change itself is quick to implement. You should have the HTTPS version of the domain created and fully propagated across DNS servers as you don’t want to be waiting about for this at a critical time. It would be best implementing at the weekend for high-weekday-traffic sites, failing that an overnight change depending on the timezone of highest use. How long before my site gets back to normal, or even improves in terms of traffic flow? Direct Traffic should continue to flow as normal but a big concern will be that search engines will need to re-index the HTTPS version of the site and transfer across any rank or creditability built up over the years. This re-index should take place quite soon (days), the search results will also start showing the HTTPS label soon (days), but the shock of the change is a longer term project to analise. When analysing traffic impact, things should be measures in weeks and months. This entry was posted in How To and tagged http, https, website by Daft Logic. Bookmark the permalink.